SR 31T - Longevity in demanding environments! Ensure patient safety and make it easier to follow data collection best practices with the SR31T healthcare scanner. 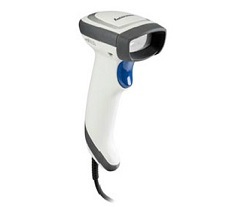 Optimized for your healthcare environment, the SR31T features a white, disinfectant-ready housing and a high performance imager capable of reading all common 1D and 2D bar codes. With the fastest time-to-read of any scanner in its class, healthcare workers can consistently adhere to data collection best practices and patient safety protocols—whether at the admitting desk, pharmacy, lab, or anywhere automated data collection is mandated. With an uncanny ability to read poor-quality codes, the SR31T can help you avoid errorprone manual data inputs. With the addition of VESTA—Intermec's patented decode algorithm—even the very small, high resolution codes commonly found on patient wristbands, pill bottles, and lab slide labels can be read with ease. Not only can SR 31T read all common 1D, PDF, 2D, and postal symbologies—it can also reliably read these codes from smartphone, tablet, and computer displays. Capture real-time video and images, read multiple codes in a single scan, scan documents or ID cards, even perform advanced data parsing routines—all with one device. The SR31T sets a new ruggedness standard for healthcare scanners, with an IP53 rating for protection against liquid and dust ingress, and an impressive two meter (6 ft) drop specification to concrete. Integrating the SR31T into your environment is truly plug-and-play, thanks to its autoadapting capabilities. And there's no need to update the scanner configuration when interfaces change, because the SR31T is smart enough to adjust itself on-the-fly. The SR31T also includes distinctive design elements that add to its versatility. Unique touches, like the over-sized LED light pipe on the scanner head, provide bright 360-degree feedback in any lighting condition—and its color can be personalized to match the décor of your healthcare environment. The SR31 can be quickly and easily customized with Intermec's exclusive EasySet™ PC programming tool. In just a few clicks, this Windows-based utility can print configuration bar codes; adjust security settings; activate or disable symbologies; and alter beeper, vibrate or LED settings.